The word ‘Declutter’ can be so overwhelming for some because it can mean two very different things. It can either mean a good clean out for all those very organised housewives out there who are looking forward to doing a much-needed spring clean, while for others, it’s a word that brings on anxiety for so many struggling mums out there who are barely managing to keep up with their daily routines, let alone a massive decluttering job. That’s why I love doing these declutter challenges with you, because, with my weekly declutter challenges you don’t have to get overwhelmed, as we tackle a little bit each week. For all of you who signed up, welcome to the third week. And for anyone who’s new to my challenges, sign up and start with me today!!! 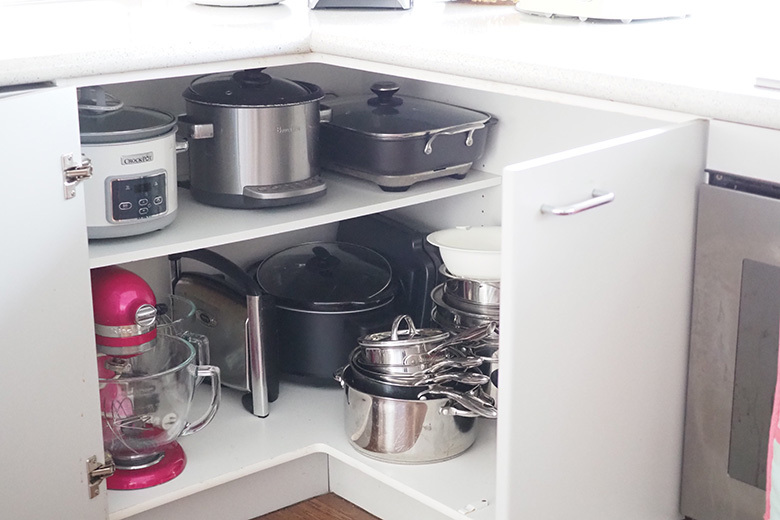 Are you a hoarder of old kitchen appliances? You know those appliances you thought you’d use (like the donut machine) but used once and put it to the back of the cupboard!! I used to keep my benchtop appliance free, but I now keep all the appliances I use daily on the bench. The appliances I don’t use so often are kept in a cupboard with easy access. 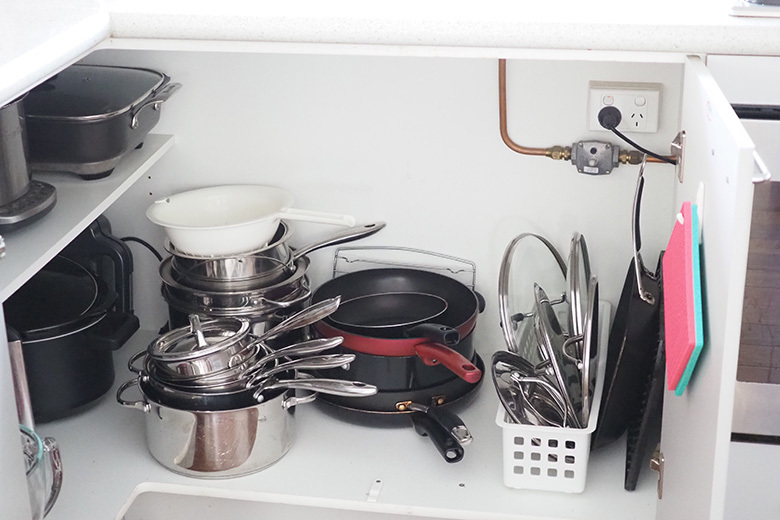 Consider purging some of the old appliances that you don’t use or need, because some of your newer appliances might do the same job for you, saving you precious cupboard space. I have a Thermomix which does the job of so many of my old appliances (ie, blender, food processor, juicer) so I’ve been able to purge a few over the years. Note: My definition of a purge – sell, donate, repurpose or throw away items as you see fit!! CHECK OUT MY INSTAGRAM HIGHLIGHTS: where I shared snippets of ME cleaning out my appliance cupboard. The saucepans won’t make it to the Declutter 52 Things in 52 weeks list, so go ahead and tidy and/or purge them too if needed. I keep the pans nested into each other and keep the lids in a long plastic basket (which I got from Bunnings a few years ago), which keeps the lids tidily together. I place smaller cake tins inside larger ones, then store them all vertically in a plate rack. I’m not going to have much to get rid of… we are off grid solar, so any appliance that wasn’t useful or chewed too much power had to go. Although I haven’t used my slow cooker in 3 years but hubby is determined to keep it ? Would love to ideas here too mine are above the oven and I’m always worried ones going to fall out on my head! Thank you Kat! I’m Mum to a toddler and a newborn and so far I’m finding this challenge really achievable as I don’t have to do to much at once, which is what normally makes me feel overwhelmed about decluttering. I’m even looking forward to seeing what each new challenge will be! I have a quesadilla maker….seemed like a great idea at the time but has never been used. It’s going! I will be taking a look at these items this evening for sure! I only have 2 saucepans, 2 fry pans baking trays. For my family of 10 but no cupboard space. Usually have to keep them in the oven and on the cook top. Maybe will gain space as I go. Fingers crossed . 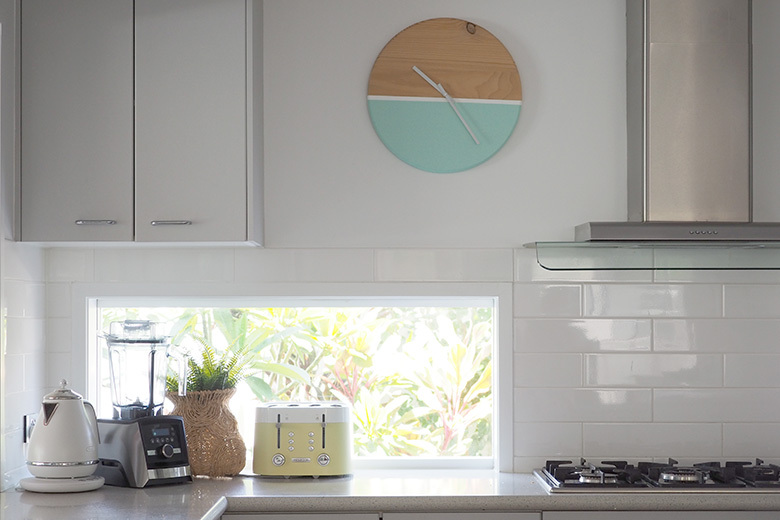 One step ahead of this one, i recently got a thermomix so I just cleaned out my appliances! Love the saucepan lid storage idea, Kat! I’ll be looking out for something like that. I too have a Thermomix so no need for other appliances! ? When nest stacking frying pans, place a sheet of good quality paper towel in between each one to stop the pans on top scratching the ones underneath. No need to do it for stainless steel saucepans as they are pretty tough, but for frying pans that may have Teflon or another non-stick surface, it really helps. So I’ve purged 5 appliances. I didn’t even know I owned an electric wine cooler. All given away via my local good karma network. Feeling awesome. 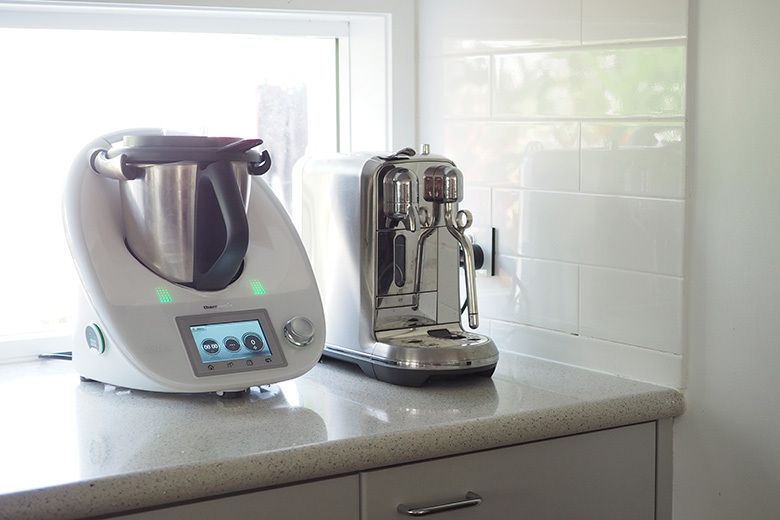 Have a Thermomix so not much to de clutter this week! May I make a suggestion though? Would it be possible to provide us with a list of de cluttering tasks that you will be suggesting down the track? I will be travelling for several months later this year and would love to tackle some extra tasks before I leave so I don’t get too far behind while I’m away! A job I’ve been meaning to do…….electric knife – out, old microwave – going, old grill – going, food processor – well, just found out it no longer works……so ditching….. Now have space in cupboard for other stuff (needed!) and a bit of re-organisation…. Ok completed the challenge but how does everyone store their food processor attachments? Maybe all together in a plastic box cleared out from last week? Or check to see if the manufacturer of your food processor has a storage thing as an accessory? I was keen to clear out with this challenge, we have a large juicer that hasn’t been used in years and I couldn’t wait to have the space however hubby wasn’t having it and wouldn’t let me get rid of it. He said we paid to much money and he might decide to make a proper juice one day. I told him he could use the magic bullet but he put his foot down. Anyone else facing these problems?? The only thing I managed to clear out was an electric knife and only because we had two! Hmm perhaps you could sell it and he could keep the profit for giving it up lol… or give him 3 months to use it, if not, chuck it! !